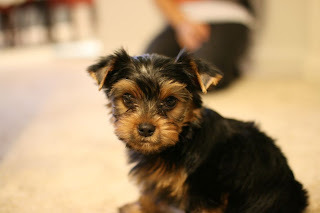 My husband and I just recently got a Yorkie. Just in time for Christmas. It was and still is a present to ourselves. So far, he has been a very great puppy. As I sit here writing this, he has been a very good boy and is sleeping next to me. He is such a sleepyhead. 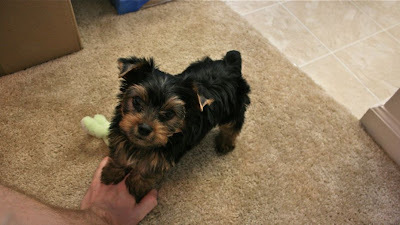 For those who don't know what Yorkies are, they are a small, toy sized dog. Their coat is fine and silky and will fall straight down on either side. Coat colors can come in a blue and tan color. Our puppy right now is colored brown black and tan as can be seen above. They are very eager for adventure and are very energetic, brave, loyal and clever. And, because of this, Yorkie's make for a very great companion, it just takes time to understand how to treat a small dog. They are very affectionate to their masters and can become suspicious of strangers. They tend to exhibit Small Dog Syndrome and will become a problem if owners do not make boundaries. So, it is best to look into your pack leader skills in order to train these little terriers. I am a new dog owner and am learning as I go along. My husband had three dogs when he was growing up so he has had more experience than I. For now, I am very much in love with our yorkie. He can be such a trickster and I'm sure we'll have many stories about him as he is growing up.